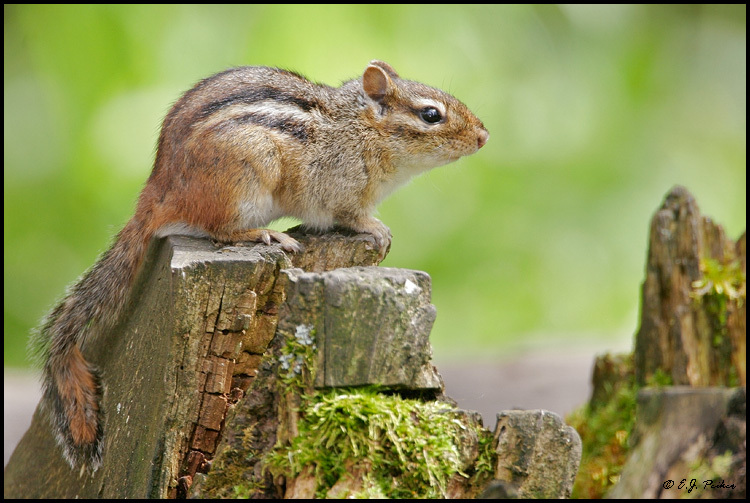 Eastern Chipmunk ; These tiny striped squirrels are only four to seven inches (10 to 18 cm) tall and weigh one to five ounces (28 to 142 g). Most would fit comfortably into a teacup. They collect all through the fall and each one has to gather about one thousand acorns and hoard them away underground for winter. They can collect around 150 acorns a day, which is far more than they need, by popping them into their expandable cheek pouches. Although chipmunks move incredibly fast, they are not hard to find in North America; so, chipmunk watching is the perfect place to start for any junior naturalist!